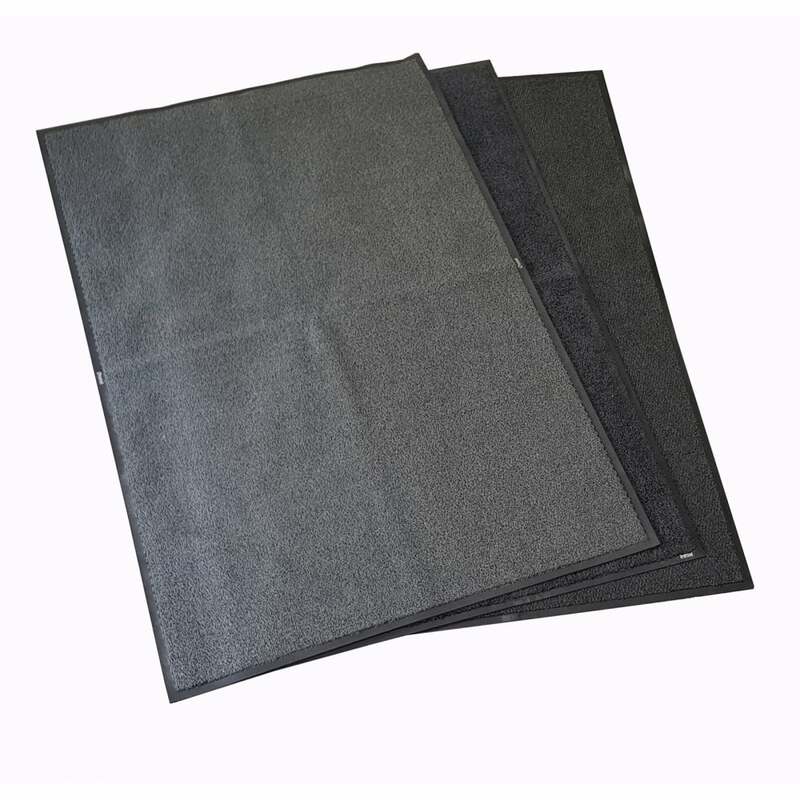 Pack of Three Grade C - Non-Slip 6ft by 4ft Dirt Trapper Floor Mats in "Dark Grey"
All sizes are approximate and may vary slightly - 180cm by 115cm. These are an affordable way to protect flooring in your home, garages, livery yards or workshops if required. They are easily cut to size or washed if required. As they are reasonably priced, they can also be disposed of if they do get too soiled for you. Fully machine washable up to 60 degrees celcius. Can be cut to size WITHOUT fraying or unravelling -guaranteed! Non-slip backing works on tiles, concrete, wooden or laminate flooring and even carpets. Excellent for livery yards, insulating stables (hang on the walls to keep heat in or prevent possible injury) etc. This listing is for dirt trapper mats (high quality materials, but these are classed as Grade C Dirt Trappers, so all of them will be marked, soiled or damaged), which measure approximately 6ft by 4ft in size and come in various colours (colour not guaranteed and picked at random depending on stock levels) complete with non-slip heavy-duty gripper backing. This colour is ideal for dirt, as dirt and oil is normally dark in colour. The mat can be machine washed, hosed down or cleaned with the pressure washer outside. Or alternatively, just grab yourself a bucket of hot soapy water and a stiff yard brush, and get to work! Trimming to size or cutting this mat in half or into different shapes to line the mat around something is a doddle (fresh stanley blade or very sharp scissors) and the sides are guaranteed not to fray, as the textile piles have been heat-welded onto the latex backing. This means that you can cut this mat to size to fit your car boot, a door way, line a crate to prevent your dog from slipping or even line the floor in your van and cut around the wheel arches. But more so these ultra absorbent and handy dirt trapper mats are used to protect flooring in garages and workshops. If you have a dripping oil leak and you don't want to ruin your working floors, just pop one of these cheap alternatives under the car. Also used as a preventative method to pop under motorbikes. If there is an oil or fluid leak, the mat will catch it and the waterproof rubber underside will make sure it does not go through to your floor. Of course, if you have a gushing leak, then the mat can only absorb as much as the textil pile is capable of absorbing. So please bear this in mind - you cannot put a mat into a bathroom, which is filling up with water expecting it to absorb it all. The textile piles are a mixture of cotton and polyester twists. Cotton absorbs and the polyester adds longevity to the mat, making it hard wearing. These are exactly the same brand of mats you will find in the entrance to Waitrose, Tesco, Asda, John Lewis etc. - they are made to work and last!! This size is very handy as it is very large and covers a good sized area. Also very commonly used in kennel runs, boarding kennels, hallways in kennels, reception areas in garages and workshops, vans, caravan awnings and caravans themselves (the carpets can afterall not be washed, so protect them with a dirt trapper cut to size), metal or fabric dog crates, car and motorbike collector's garages etc. Please note that all seconds may have ID cut outs on the black rubber border, which is a process undertaken by the manufacturer of these mats to ensure that none are resold into the retail market. This does not affect the usage or gripper backing of your mat. The black border may be trimmed away from the textile pile, leaving a neat carpet pile without an industrial looking rubber border. Please be prepared to have a part missing of this rubber border - as these dirt trappers are clearly sold as EX CONTRACT mats. They may even have a whole rubber border missing or two. These mats are not sold as perfect but with damage. They have been used in the past and are old ex-contract mats. They have been professionally cleaned prior to sale & deemed as ex-contract by the manufacturer. This means that they may have a small area of worn carpet pile, a small split in the backing or a tiny mark or burn, a cut in the border or missing borders etc. We hope that you get the idea - these are presentable mats for garages, kitchens, utility rooms but also hallways. We also sell a better grade (Grade A) to be able to use in your home for the "bring-your-best-china-out" situations, which are high quality seconds. We cannot stress the above enough, as we do not want disappointed customers. Therefore, one last time, please be advised that all dirt trapper mats sold by Splendid Pets Ltd on this listing are ex-contract mats or factory seconds sold clearly with declared damage or small marks or imperfections! This is the main reason why we can supply commercial grade Dirt Trapper floor mats to you 80% less than the RRP and why they continue to be one of our best sellers at all the UK's Championship Dog Show. These mats can also be used in busy community hallways for "people use" rather than dog use. Town halls, surgeries, university corridors, canteens... We sell different sizes from 4ft by 3ft, 5ft to 3ft and 6ft to 4ft, and also runner dirt trapper mats from 10ft by 3ft or longer or wider. Other colours are also available. Main colours you can get are mottled grey, mottled blue, mottled brown or tan and a few reds and greens. We also sell Logo Mats, which basically have shop logos on them - they are fun, colourful and always thicker in the textile pile as you need more thread to create the logos. So these are a good alternative too if that's something for you and you don't mind the colour! Please note the photos used are an example of what your dirt trappers will look like, but also examples of other mats, colours and sizes to give you an idea of possible usage.